A major leading bank is disposing off 900 Acres of coffee farm with RED SOIL. 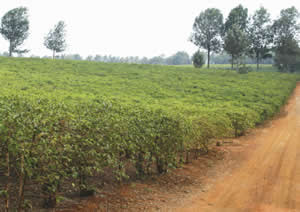 The farm is 7 kilometres off Thika Road Super highway, Juja – Thika district. The land is to be sold as a block or in portions measuring strictly minimum 1 Acre, 2Acres, 5 Acres, 10 Acres, 20 Acres, 25 Acres,30 Acres, 35 Acres, and blocks of 50 Acres Maximum. The land is being sold “As Is Where is– basis”. Interested buyers should express their interest in writing indicating the desired Acreage. Price for an Acre is 3.5 Million fixed Price. An Acre is being sold together with mature coffee bushes, particulars are not warranted as of now, but later after application. Payment period is strictly 6 months, submission of expression of interest should reach the bank latest by September 5th 2011. The bank encourages Individuals, Corporates, Saccos and other Institutions to apply. Only serious buyers shall be contacted upon selection and for the purposes of viewing the property and verification of erections thereon. If you don’t get communication from the bank kindly consider your application unsuccessful.